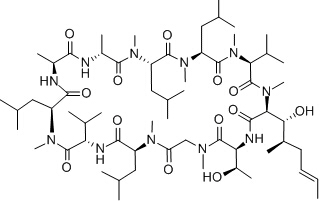 Flutrimazole is an imidazole antifungal agent that is imidazole in which the hydrogen attached to the nitrogen is replaced by a 2,4'-difluorotrityl group. Neticonazole hydrochloride is a hydrochloride resulting from the formal reaction of equimolar amounts of neticonazole and hydrogen chloride. Amorolfine is commonly available in the form of a nail lacquer. It is a topical application used to treat fungal nail infections. Isavuconazonium is a triazole antifungal agent used primarily in the treatment of invasive aspergillosis and mucormycosis infections. Candicidin is a mixture of antifungal heptaene macrolides from Streptomyces griseus or Actinomyces levoris used topically in candidiasis. The antibiotic complex is composed of candicidins A, B, C, and D, of which D is the major component. 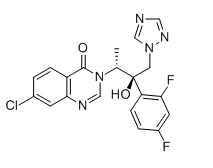 Albaconazole, also known as UR-9825, is a 14alpha-Demethylase inhibitor potentially for the treatment of fungal infection. 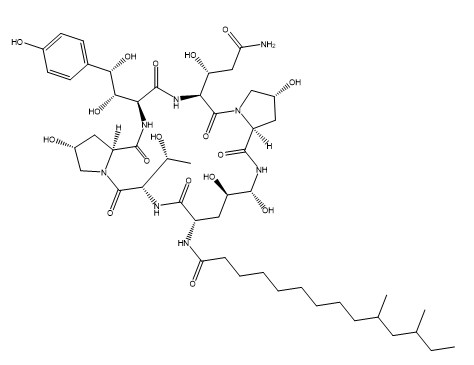 Cyclosporin C is a broad-spectrum antifungal agent against filamentous phytopathogenic fungi but no activity against bacteria or yeasts.